A Riverside County Superior Court judge has ruled that a proposed industrial warehouse project adjacent to an important wildlife preserve cannot proceed in destroying habitat for imperiled wildlife. The proposed warehouses on Alessandro Boulevard — just south of the city of Riverside’s Sycamore Canyon Wilderness Park — threaten to sever the last remaining natural connection between the Sycamore Canyon Wilderness Park and the March Stephens’ Kangaroo Rat Preserve. Kangaroo rat. Image from UCR "Images of the Natural World"
The court found that Riverside County improperly ignored the neighboring March Stephens’ Kangaroo Rat Preserve when it approved warehouses on endangered species habitat. This ruling follows a series of successful legal challenges to development proposals on western Riverside’s few remaining natural places, which were prompted by the failure to follow obligations in the Stephens’ Kangaroo Rat Habitat Conservation Plan — a plan originally proposed to strike a balance between wildlife protection and development. Conservation groups in 2011 reached a successful legal settlement that protects important wildlife habitat and reduces greenhouse gas and air pollution on a nearby industrial warehouse project that threatened Riverside’s Sycamore Canyon Wilderness Park. Another legal challenge resulted in a settlement agreement that overturned a decision to develop the 1,100-acre March Stephens’ Kangaroo Rat Preserve. Negotiations for permanent protection of the preserve are ongoing. The conservation groups that challenged the industrial warehouse proposal — the Center for Biological Diversity, San Bernardino Valley Audubon Society and Friends of Riverside’s Hills — also opposed the extensive diesel-truck traffic that would worsen regional air-quality problems and global warming. Numerous threatened and endangered species live in these areas of western Riverside County and are threatened by unchecked development, including the Stephens’ kangaroo rat, bobcat, burrowing owl, least Bell’s vireo and coast horned lizard. Background: The Stephens’ Kangaroo Rat The Stephens’ kangaroo rat can be glimpsed at night hopping through arid grasslands in western Riverside and northern San Diego counties and searching for seeds, which it stores in its large cheek pouches. During the day it takes refuge in burrows that are cooler and more humid than the surrounding desert. Habitat loss due to rampant sprawl and historic agriculture has claimed 95 percent of this kangaroo rat’s original habit; changing rainfall patterns and increasing drought due to climate change may threaten the rest. 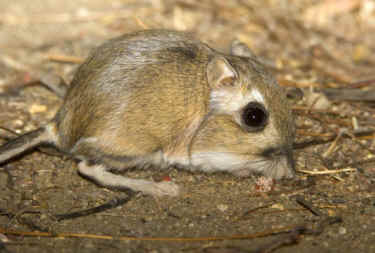 Stephens’ kangaroo rat populations fluctuate with the amount and timing of rainfall, which affects their food supply. Because this kangaroo rat’s habitat has been so severely fragmented, its remaining isolated populations are more vulnerable to extinction.